US astronauts Chris Cassidy and Tom Marshburn are carrying out an emergency spacewalk to fix a leak of ammonia from the International Space Station’s cooling system. Live video shows Chris Cassidy and Tom Marshburn examining the outside of the craft to search for the escape. The crew had spotted particles of ammonia drifting away from the laboratory on Thursday. It is expected the spacewalk, prepared at record short notice, will last around six and a half hours. Liquid ammonia is used to extract the heat that builds up in electronic systems, dumping that excess energy to space through an array of radiators. NASA says the crew on the ISS are not in any danger. The leak is coming from the station’s port side, at the far end of the backbone, or truss, structure that holds one of the laboratory’s huge sets of solar arrays. The astronauts will “inspect and possibly replace” a pump controller box in that area of the space station, according to NASA. Commander Chris Hadfield reported seeing “a very steady stream of flakes” on Thursday. “They were coming out cleanly and repeatedly enough that it looked like it was a point source they were coming from,” he added. It is not the first time that the station’s cooling systems have caused problems. 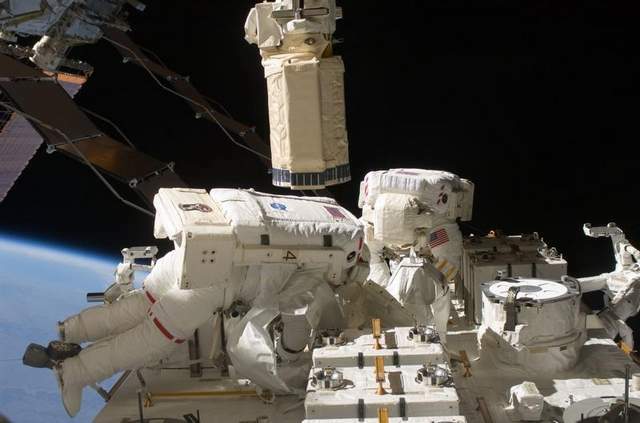 A very small leak was identified in 2007 in the same location, and a spacewalk was organized in 2012 to reconfigure coolant lines and isolate the problem. The station currently has a crew of six. Commander Chris Hadfield, a Canadian, is due to leave the platform with American astronaut Tom Marshburn and Russian cosmonaut Roman Romanenko on Monday. Commander Chris Hadfield had asked mission controllers if the leak might prevent the undocking of his return capsule. They responded that there was no technical reason why it should, but that engineers would update the crew once they understood the issues more fully.